Additions to basic recipe are only fettered by your imagination. Ex: Chipotle pepper, jalapeños, basil, etc. I personally love a few shots of Sriracha sauce. If using dried chickpeas, soak overnight and then simmer until soft. About 1.5 hours. If using canned beans, rinse them off before using. 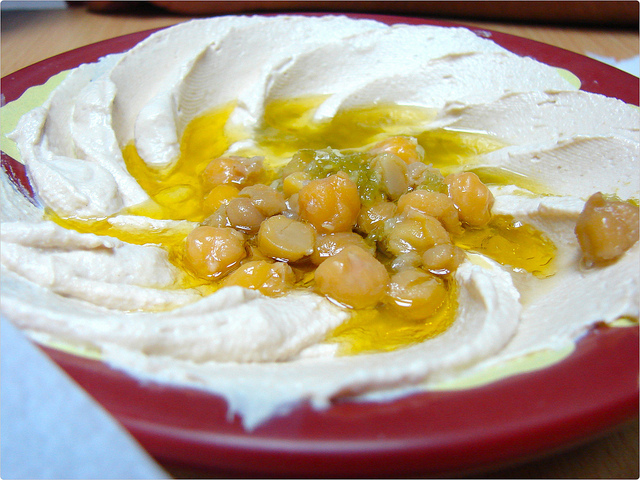 In a food processor combine chickpeas, garlic and tahini paste. Process until smooth. Add pepper, salt, and anything else that floats your boat. Process again. Serve room temperature, with crudité, bread, or crackers. I have been using hummus as a sandwich spread with grilled eggplant slices, and it makes a cheap, filling, quick sandwich.